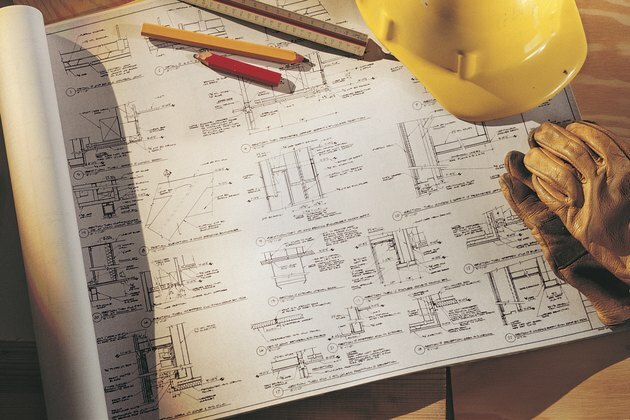 Architects and engineers communicate with building trades in the form of construction plans and specifications. Reading blueprints is a skill that improves with each exposure to graphic language. Drawings are accompanied by written specifications. Depending on the size of the project, the specifications may be separate documents or contained in the form of notes on the drawing. Note that where drawings conflict with written specifications, the specifications override the drawings. Reading construction plans in conjunction with the written specifications gives a clear understanding of the concrete portion of a structure and associated work. Blueprints aren't put away until construction is completed. Review drafting manual for symbol identification, especially symbols for concrete, gravel, soil and reinforced steel bars and welded wire mesh. Become familiar with line conventions, including line weight, dashed and hidden lines and lines showing dimensions. Examine the general conditions section of the written specifications first and note areas of responsibility and special concerns related to construction. Highlight points of potential conflict or confusion. Find plans outlining concrete structures and related work, such as sitework and foundation plans. Organize plan, elevation and section and detail drawings for ease of cross-reference. Keep the written specifications close at hand. Examine the plan views for horizontal information, such as layout and dimensions. Note reference and finish elevations, interior and exterior drainage details and locations where concrete work intersects with other trades. Study door and window openings for locations and dimensions. Look for notes about reinforcing steel. Cross-reference plans with elevation, section and detail drawings for vertical information. Distinguish between typical details -- practices repeated throughout construction -- and specific details that occur only once. Check written specifications for concrete mix design, subgrade material description, standard for quality of work and how to perform the work. Study any shop drawings for fabrication and connection details for special work. Compare ground conditions with plans and note any discrepancies. List questions and observations and consult with the project manager for clarification.